Note that "than last year" is really the key part of the story (and didn't make the headline). Worcester's foundation enrollment is 27,800 students; the foundation budget is $374M. 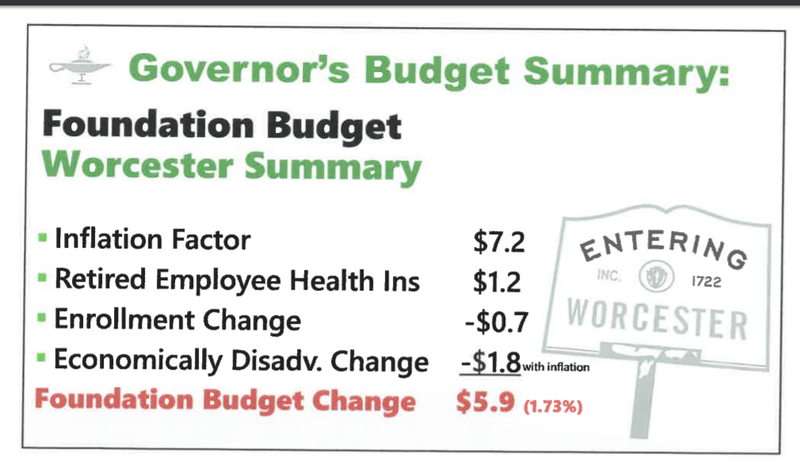 First, remember that the only things that traditionally shifts the foundation budget--and thus the Worcester Public Schools budget, which is little more than that--are enrollment and inflation. And, in short, both are working in our favor this year. My personal rule of thumb is costs tend to go up by 3%, excluding health insurance. That isn't perfect, by any means, but it does mean it's a bit better to be looking at an inflation rate over 3%. Pretty crazy jump in preschool there. The overall Worcester trend line, putting us, as we are usually reminded, over the enrollment Worcester was at when we had more elementary schools makes me wonder: are we talking about where we're putting these kids? Or are we going to continue to pretend that this isn't a facilities issue with municipal-side implications? 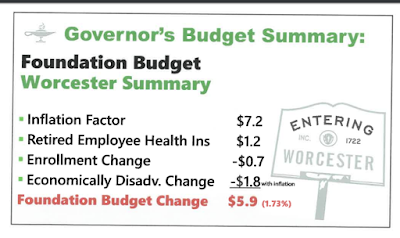 And then, this post on the changes in the foundation budget proposed by Governor Baker? This is all working in here, as well. Something I don't know enough about is how the Governor's proposal on charter reimbursement (not the 100/60/40, but the enrollment over five years) hits Worcester. We don't really have a significant growth in charter seats, so I wouldn't think it would work in our favor. To which my comment was "ouch." Thus, let me say, I'm not complaining. At the same time, remember that the entire premise on which the Worcester--and all--budgets are founded is undercalculated by probably at least $2B. And note where most of the bump comes from: a good inflation year! That means not having a tough year is essentially a toss of the dice. This is no way to run a budget. First, I refuse to let the city off the hook. Only the municipal side can fund a lawsuit, yes, so let's see about that in this budget. But let's also see the city put some real funding towards the schools. I am deeply concerned that the city has done essentially nothing with the $70M backlog in essential repairs in schools. We have a facilities audit that essentially was ignored cityside. We know that every year of an undercalculated foundation budget continues to undermine (almost literally) the facilities, as operations and maintenance runs at 60% or so. INCREASE THE CAPITAL BUDGET. The amount the city contributes towards the schools in capital each year is shameful. On the state side, we need to take a look at charter reimbursement. The Baker budget is doing something philosophical as well as budgetary in this shift in funding. The reimbursement is actually intended to smooth the year to year shifts, not the long term gaps. This is a change in the philosophy of reimbursement. The Legislature should fully fund reimbursement. Honestly, I think the state should just line item charters, but no one is asking me that. Also on the state side, the health insurance jump (of 7%ish) is a start, as is the shift on English learners. We still aren't recognizing real costs, however, and progress still is overdue. Also, no one appears to be talking about the 6% drop statewide in the number English learners due to the change in who qualifies. Let's talk about if that is a change that should be made (my inclination is to say no, as even those who test out still need some supports in many cases; this is not my area of expertise by a long shot, however). And low income? The recommendation is 50% to 100% of the foundation budget per student. Let's get real on numbers here. We hear nearly daily about the toll poverty takes on families and on children in particular; let's put some resources towards that need. I'll follow up this posts with some emails to city councilors and legislators. If you're in Worcester, I'd urge you to do likewise.